I’ve been waiting exactly a year for the second Beyonders book. I read the A World Without Heroes at family camp last year. 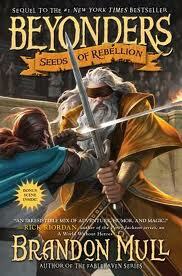 This year I checked out Seeds of Rebellion to read at camp once again. We leave today but, ahem, I finished the book last night. Drat! (Note: This was written three weeks ago.) I did have a little trouble recalling details from the first book. People and places were mentioned that I couldn’t remember right away, but most of the time I figured them out through context. I fear I’ll have the same trouble next time; the final book of the trilogy releases in the spring of 2013. This one felt a little nebulous. After the very definite quest of book one, I felt like Jason’s return to Lyrian didn’t really have much point. He was such a brave hero in the first go-round, but this time he’s more of a tag-along, a liability almost, dependent on others stronger than himself. They all seem stronger than him. Rachel discovers a powerful knack for the magical language; Aram, the half-giant, is bastion of strength—at least half the time; Ned has tremendous cunning and knowledge of poisons; Tark turns out rather courageous; Ferrin the displacer is irreplaceable; and even old, blind Galloran finds unexpected strength and resolve. But no one seemed to have much of a plan about how to defeat Maldor. Once the tiny group of rebels assembles, they journey to the land of the Seed People—they know they need all the allies they can gather—and they find plenty of adventure along the way. But when the Amar Kabal hesitate to join them and openly defy Maldor, a mixed company is formed to travel to the oracle and learn whether resistance against the evil wizard has even the slightest chance of success. They make it to the oracle, barely, and learn they have one chance in a million, which is more than they hoped for. But to succeed, they must split forces. Two tasks must be accomplished, one by Galloran and one by Jason, if they are to succeed. And I was rather glad to hear it. That means the little band with have a purpose once again in book three, and Jason will return to prominence. Though I enjoyed book one more (once I got into it), this one did keep me reading. There are plenty of casualties, but the few squeamish moments of book one are absent. It’s a bit milder. In his Author’s Note, Mr. Mull mentions that he’s been working on this series ten years. That’s amazing, and I applaud his efforts. But I’m afraid the series will never place among my favorites. I do have to say he knows how to plug in excitement; the wandering band finds danger at every turn. And he’s endlessly creative. But the humor is just a bit bland, and the series never attains much depth. It does have purpose—defeat the Great Evil—and it has danger and magic, courage and honor, but those deep moments of reflection, of inner discovery, are few and far between. I must mention a very nicely written scene, however, in which Ferrin is examining his motives for betraying Maldor and joining the rebellion. He’s uncertain of himself and his loyalties. In my opinion, that is the most powerful, most emotional, most honest moment in the series. I wish there were more like it. Content is clean and so is the language. It is violent in a fantasy adventure sort of way but not inappropriate. I’d give Seeds of Rebellion a 10+ rating because of length, though there’s no reason to prevent younger readers from picking it up. I have read Fablehaven by Brandon Mull and really enjoyed it. My students love the series. I have the first book in the Beyonders series- but I haven’t started it yet. I enjoyed your honest review on the 2nd book in the series! I keep hearing good things about his Fablehaven series. I need to get my hands on that. I really liked the story in the first but I thought it was a bit hard to get into at first, but then it was great. The second book I got into right away! I can’t wait for the new one! I remember that, Erik. We had real similar opinions on that first one. The new ones worth it. Get it as soon as possible. Ferrin was the only reason I finished this series. Otherwise it rolled on a bit with the pointless moss and such. And honestly? After reading the prophecy, I think he’s going to die. No spoilers, though. I didn’t realize it was out already. I’ll put it on my summer tbr list. Thanks, Lina!